Nia Coffey rises for a shot. The senior forward made just 6-of-20 shots against Michigan. 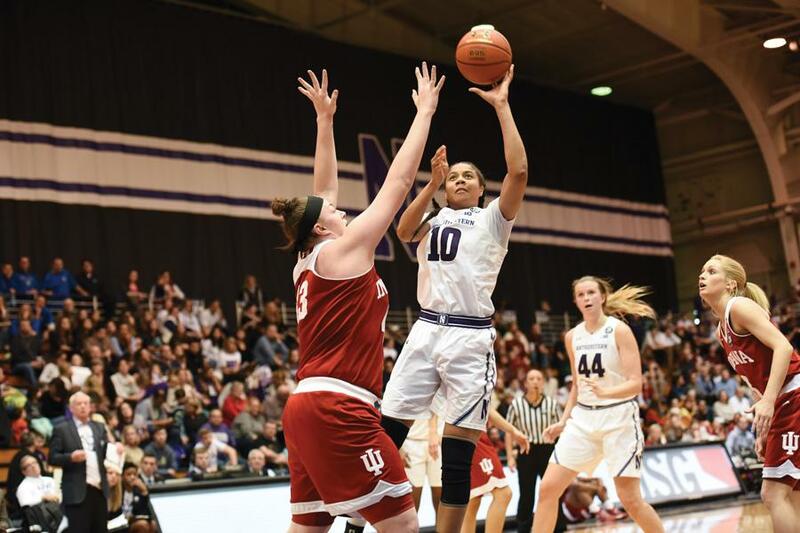 Just over a week ago, Northwestern’s offense put up an impressive 76 points despite senior forward Nia Coffey scoring under double figures for the first time in nearly two years. But Wednesday night’s game at Michigan made the Wildcats’ prolific scoring performance seem like a distant memory. NU (15-5, 4-3 Big Ten) shot just 34 percent as a team in an 80-54 blowout loss to the Wolverines (17-5, 6-2). Its two best players combined to make just a quarter of their field goals. NU scored a season-low 19 points in the first half, and the Cats’ 54 total points were their fewest in a game since Feb. 20, 2016. A 20-point third quarter padded some of NU’s stats, but a 22 percent shooting effort before the break decided the outcome early. Coffey was inefficient from the field, finishing with 16 points on 6-of-20 shooting, and senior guard Ashley Deary struggled as well, scoring just 4 points. But Coffey and Deary weren’t the only players struggling Wednesday. Senior forward Lauren Douglas shot 2-of-10 and freshman forward Abi Scheid, who put up 20 points against Ohio State earlier this month, made just one shot. Many of those numbers contrast sharply with the team’s stats from last Tuesday’s win against Michigan State, when Deary put up 20 points on the back of a perfect 10-of-10 effort at the free throw line and Douglas added 13 more. Playing without a pair of its regular starting guards, senior Christen Inman and junior Lydia Rohde, NU relied on sophomore guard Amber Jamison, who tallied a career-high 22 against the Spartans, and added another 16 points on Wednesday. The unavailability of Inman, the Cats’ second leading scorer at 13.8 points per game, left NU without a consistent midrange threat, and Rohde’s continued absence — she last played Dec. 28 — robbed them of a reliable 3-point shooter. NU has had little trouble finding the bottom of the net recently, topping 80 points twice in its last five games, but Michigan’s defense presented a particularly tough test. The Wolverines entered Wednesday allowing just 58.3 points per game, good for second in the Big Ten, and opponents shoot just 38 percent on average against them. The Cats’ offensive struggles went beyond an inability to make baskets, however. NU tallied 19 turnovers, including 10 before the intermission. They were also poor at the free throw line, converting on just 5-of-12 attempts. With another tricky road test coming Sunday at Rutgers, which has rebounded from a horrific non-conference season and is third in the Big Ten in scoring defense, NU will need to adjust quickly from Wednesday’s poor performance. McKeown is confident in his team’s ability to make that happen.